What is hummingbird cake anyway? Oh I’m SO glad you asked. First, it’s a Southern thing. I think it may have originated in Jamaica, but apparently the South heard about it and just ran with it. It doesn’t have anything to do with hummingbirds. Maybe it’s just sweet enough that hummingbirds would want to eat it too…I don’t know. Hummingbird Cake is made with oil, not butter and it’s also got bananas and pineapple in it as well. And as I always do, I had to spice it up a bit and they turned into these Hummingbird Cheesecake Topped Cupcakes. 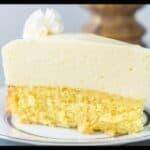 So you’ve got a moist banana pineapple cake, topped with a baked cheesecake topping and then a rich and creamy cream cheese buttercream. I’m telling you…these are addictive. I used a 1M icing tip to pipe on the buttercream. You could also use a 2D. 1. 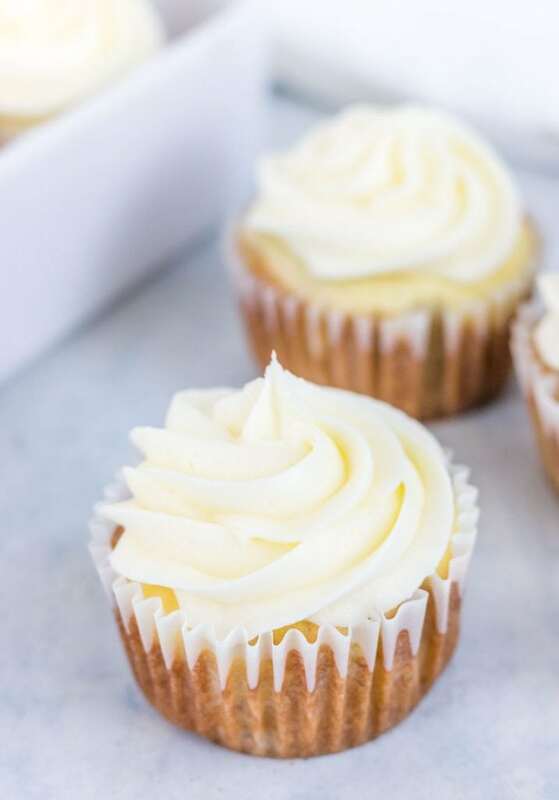 You’re only filling each cupcake liner half full (2 Tbsp) and that’s because you’ll be adding in a bit of the cream cheese filling mixture in each cupcake as well. 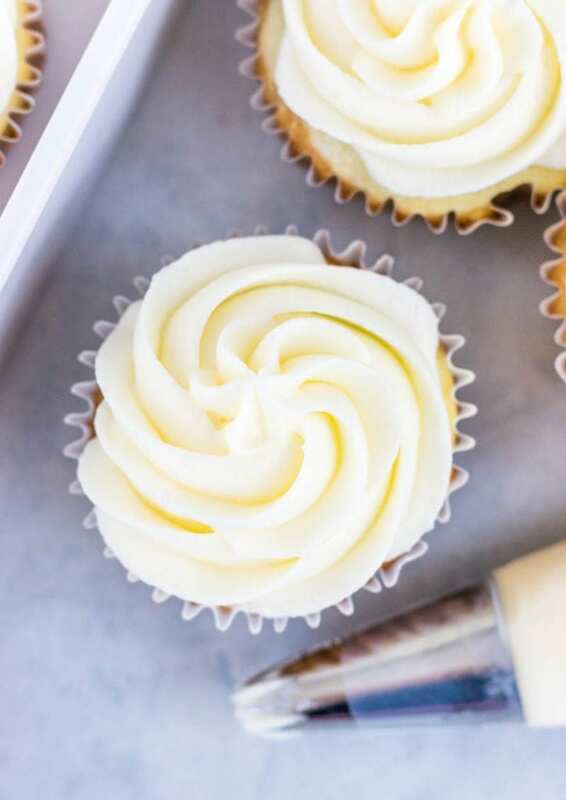 If you want to skip the filling, then the cake batter alone should make about 24 cupcakes. 3. These babies taste so freaking good that you’ll just want to eat more. So, more is better right? Ok, let’s get to the recipe…and don’t forget to check out the video below as well. 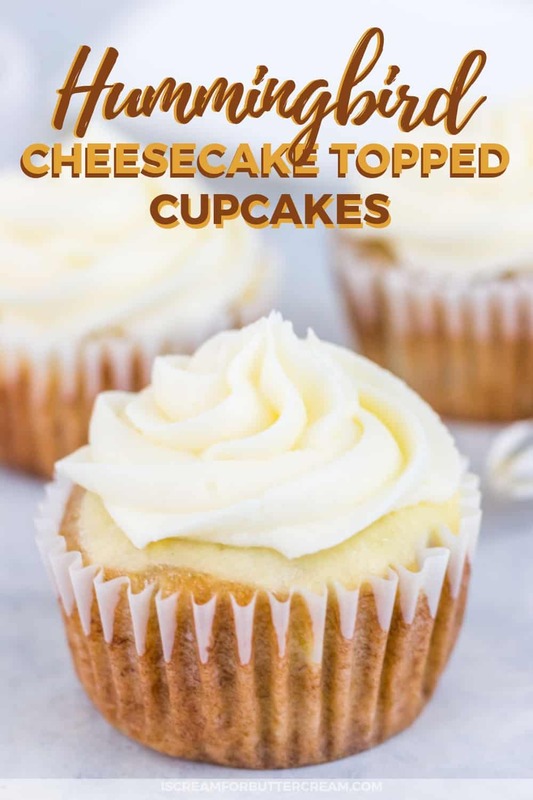 These hummingbird cheesecake topped cupcakes are a super moist banana pineapple cupcake, topped with a baked cheesecake topping and then a rich and creamy cream cheese buttercream. Wonderfully addictive. Mix all the filling ingredients together and set aside in the fridge to chill while you mix up the cupcake batter. Preheat oven to 350 degrees. Fill three cupcake pans with cupcake liners. (If u only have two cupcake pans, just use the two and chill the leftover batter until the others bake, then use the pan). Mix flour, sugar, soda, salt and cinnamon in a large bowl. In another bowl, mix together the eggs and oil and vanilla. Pour the egg mixture into the dry mixture and mix with a spoon. Add in the pineapple and mashed bananas and mix with a spoon. Add in nuts if desired. Spoon two tablespoons of cake batter into cupcake liners (about halfway full). 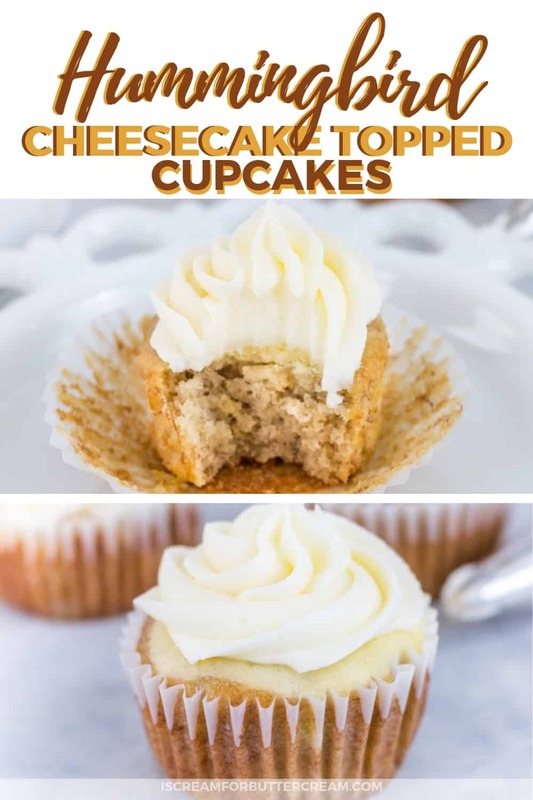 Add in a scant tablespoon of the filling on top of each cupcake. Bake at 350 degrees for 20 min. 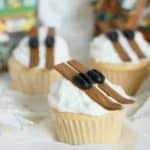 This recipe makes 36 cupcakes which is three cupcake pans. 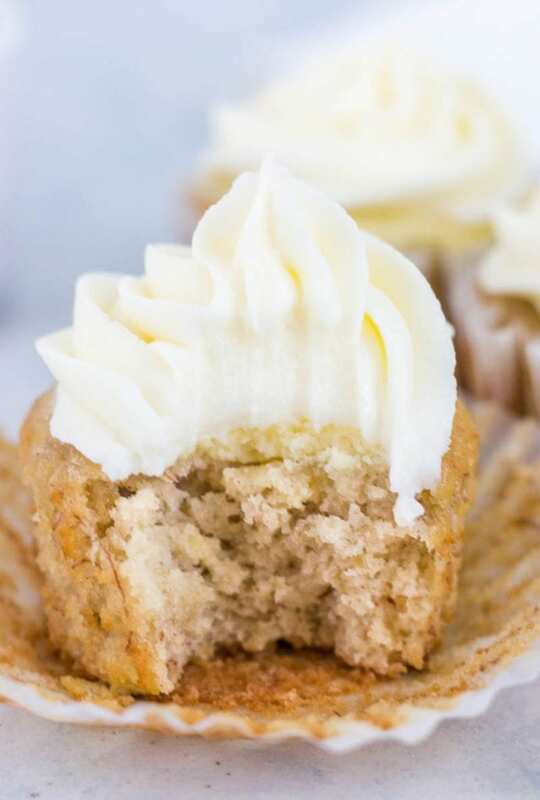 If you only have two cupcake pans, Chill any remaining batter and use it as soon as the other cupcakes bake and cool enough to remove from the cupcake pan. Cool completely before adding cream cheese buttercream. The tops of cupcakes will flatten out a bit while cooling because of the filling, but that's to be expected. 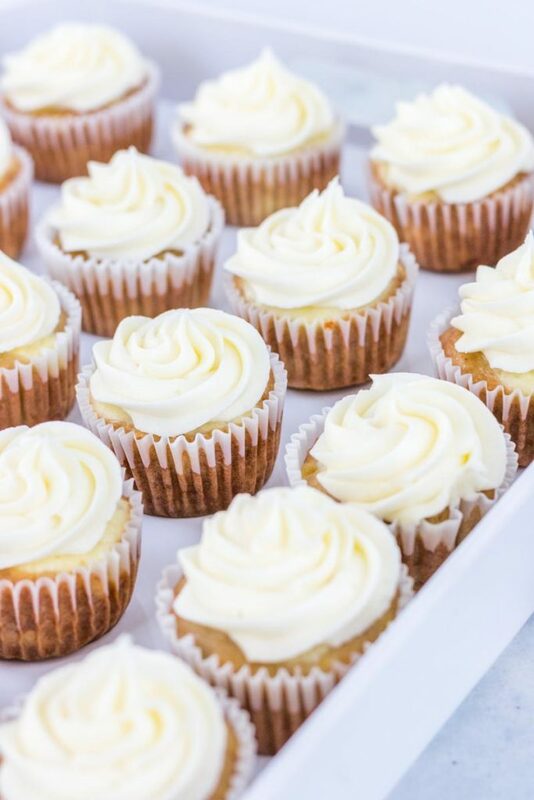 You're about to pipe on some buttercream so don't worry. Mix together the softened cream cheese and softened butter. Add in the confectioners sugar plus lemon juice and mix well. Pipe onto cooled cupcakes. I used a 1M piping tip. 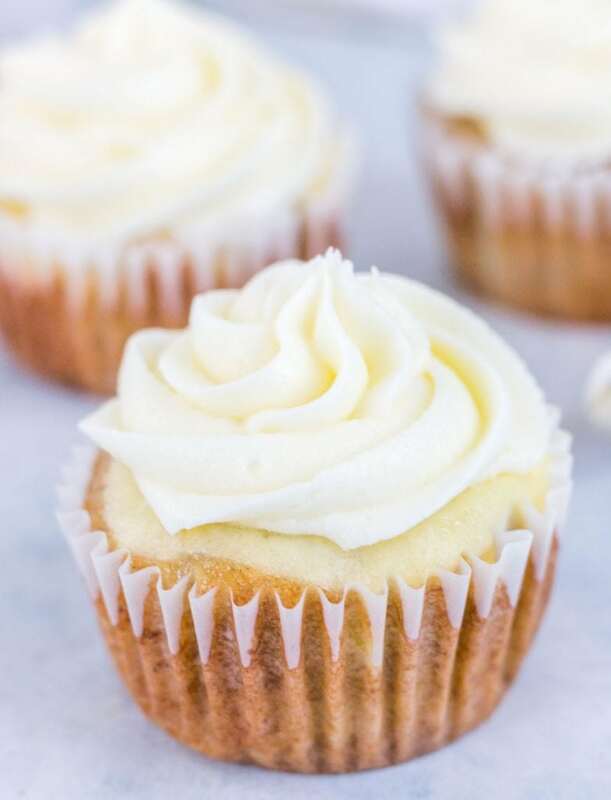 Cupcakes should be kept in the refrigerator because of the added cream cheese. 1. 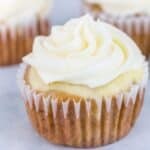 You're only filling each cupcake liner half full (2 Tbsp) and that's because you'll be adding in a bit of the cream cheese filling mixture in each cupcake as well. 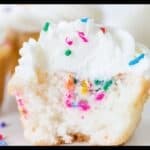 If you want to skip the filling, then the cake batter alone should make about 24 cupcakes. 3. These babies taste so good that you'll just want to eat more. So, more is better right? 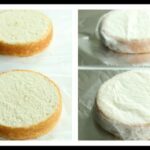 I loved the step by step of your recipe. I’m going to test this weekend. But only by the photos it already looks tasty. Oh I’m glad the step-by-step is helpful 🙂 Let me know how you like it!